This home also offers free beach Chair Service (seasonal) and bikes included with your stay! Permitted Beach Fires Available through La Dolce Vita. "The Rest of Me" has just been redecorated with new light paint colors, furniture improvements, new Ultra HD Living Room TV and much more! The pool was also re-plastered and is good as new! The home is located in Water’s Edge, a gated, upscale, Gulf-front community bordering Rosemary Beach on the Gulf side of Scenic Highway 30A. Furnished in casual elegance, with five bedrooms, two dens, and a tower room, this spacious vacation home sleeps up to 16 guests. The private pool can be heated for a fee, allowing enjoyment in any season. A palm tree-lined pedestrian path leads to the neighborhood’s beach walkover just 100 yards away. Free Beach chairs/umbrella (seasonal) set up and adult bikes included in stay. With only 26 home sites and a security gate, Water’s Edge is the perfect location. The living room is comfortably furnished for relaxation and has a large HD flat panel SMART television with Sports Programming, Netflix, Pandora, and additional components for all your entertaining needs, including Free Wifi and Blue-Ray SMART DVD player. The kitchen has custom cabinets, stainless steel appliances, and granite countertops with barstools that seat four. The dining room table seats eight, while an adjacent table has additional seating for four. A retractable screen installed at the double front door allows breezes on cool evenings. Two bedrooms are downstairs, and three on the second floor. All second floor bedrooms have access to balconies with partial Gulf views. The third floor tower room is furnished with a futon and has access to a private balcony with partial Gulf views. Small dog friendly for an additional fee. Just west of Dune Allen Beach, in Sandestin off Hwy 98, is the new Boulevard 10 Carmike Theatre featuring (9) state-of-the-art screens and (1) over age 21 Ovation Dining Club. The Ovation Dining Club offers moviegoers a more intimate, sophisticated experience, with lush leather seating, swing around tables, a wall-to-wall movie screen with a wide selection of premium beers and wine and a full-service restaurant experience. An easy drive to the east is Panama City’s new Pier Park, a mega outdoor shopping mall consisting of over a million square feet of specialty shops, retailers, and restaurants - plus the 16-cinema Grand Theatre. We love the Water's Edge neighborhood! It is gated, easy walk to the beach and close to shops/restaurants/entertainment. This is our fourth year in the neighborhood and the fourth house we have stayed in. This was not our favorite. It is getting very worn down. The toilet handle in the bedroom, the front door handle and the pool gate latch were all broken when we arrived. They were fixed after a phone call to Royal Destinations, but not a great first impression. We also paid extra for the pool to be heated. We had to call again to have them come service the pool because the heater was not working. This is disappointing when you have a lot of kids in the house that would like to swim. We had 16 people in the house (6 adults and 10 kids), I would have liked more storage for the kitchen. A pantry would be nice for groceries for the whole week. Overall, the house was fine but I would not stay here again. We apologize for your issues! We were happy to get them resolved quickly. Your thoughts on more storage for the kitchen will certainly be passed along to the owner. Thank you for taking the time to leave a review, we hope you will come stay with us again at Royal Destinations! We had a great time with 2 families at rest of me! The house was great and the beds were very comfortable! We loved the location. The pool and deck were smaller than we expected but we still had a great stay! The company was also very responsive to any service issues we had. Thank You for your review!! Rest Of Me sits 100 yards from the beautiful beaches of the Gulf! There is private access when you stay in the community of Watersedge and Rosemary Beach is a short walk to the restaurants and shops! We are sorry about the pool being smaller than expected but we hope that you enjoyed the pool and it can be heated for a small fee next time you come! Royal Destinations looks forward to seeing you again very soon! Thank You For Your FIVE STAR REVIEW! Rest OF Me is just 100 yards walking distance from the private beaches of 30A!! Rest of Me comfortably sleeps 16 and is also a dog friendly house! There are four bikes that you can ride up and down scenic 30A on to Alys Beach or to Rosemary beach. Royal Destinations looks forward to seeing you again very soon! This is a very nice beach house. The neighborhood is quiet, even though the houses are very close together. Parking is a little tight but there were no problems. The house was very clean. The bedrooms have plenty of space. The kitchen had all the utensils we needed. The living room was nice for the whole family, we had plenty of room. The walk to the beach is short and easy. It was very nice not having to cross a street. The beach chairs are tagged for each house, but on several days they were very close together, but that's the nature of the beach during vacation times. Hi Mr. A, and thank you so much for the review of The Rest of Me. We are thrilled to hear that you enjoyed this beach house. We couldn't agree more on how comfortable this house is. The bedrooms and living areas are spacious, and the homeowners put a lot of effort into keeping the place kept in good shape. The home has its own private pool, as well as complimentary bikes and beach chairs (seasonal). We hope you come back and stay with us again soon! Great house for large family! Excellent location for Rosemary and beach access. House could use some updating. Need some kitchen food storage space. Royal Destinations quickly responded to a couple of repair problems. Overall good rental! Hello and thank you so much for the nice review! We love the layout of The Rest of Me! The bedrooms are spacious and each one has it's own bathroom, making it ideal for multiple families. The owners understand the need for storage space and have cleared out one of their kitchen cabinets for guests to store food. We are happy to hear that our maintenance staff was quick to respond to any repairs during your stay. The home is located in Water's Edge, a gated community next to Rosemary Beach. You can enjoy the private beach access, complimentary beach chairs (seasonal) and bikes. We hope you come back and stay with us again soon! We stayed June 30 - July 7, 2018. We had a group of 13 people (age range 15 to 54 years). The house was perfect. It was plenty of space, very well stocked with kitchen items, WiFi, TVs in every room, etc. It is convenient to beach access and within walking distance to several good shops & restaurants. Management company was good - for example, we realized the blender didn’t work and they immediately brought us a brand new one no questions asked. Pool is small, but a nice addition for an afternoon beach break. Pool lights for night are broken. Mgt knows & I’m sure it will be fixed soon - it didn’t affect us at all. This house is much better than the photos depicted. It’s a great house for 3 families with older kids! Hello and thank you so much for the review! we are so happy to hear that you enjoyed the house! The Rest of me is a great home for multiple families and sleeps 16 comfortably! We have the pool light on order to get repaired this week. So sorry that you were unable to use it during your stay. 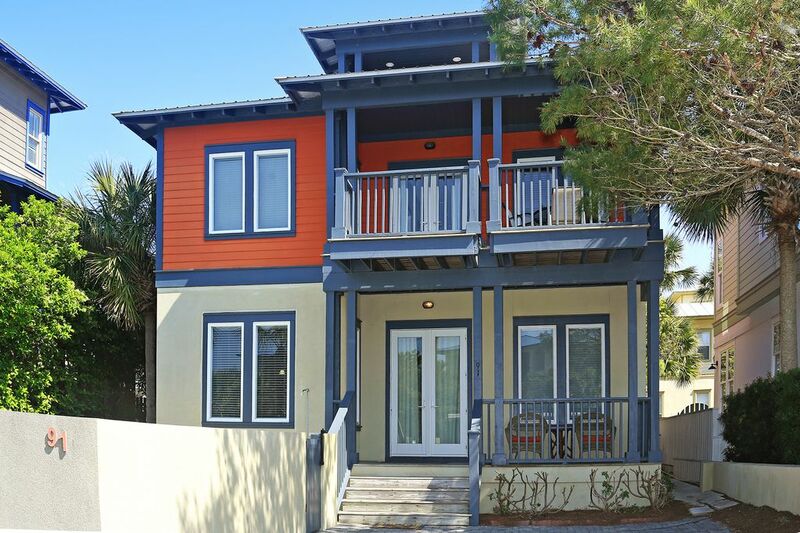 The home is located on the south side of 30A, close to shopping and dining, and just a few steps away from the beach! We hope you come and stay with us again soon!